Barbados’ Holders Season gave its audience an extraordinary gift last evening: Rosey Chan, a young British woman who plays piano like a goddess. She’s called a classical pianist but she’s actually a performance artist whose rich fabric of classical music is woven in a tapestry of jazz improvisation, contemporary electronic music and performance art. Last night’s performance by Ms Chan mesmerized. Greg and I returned home around 11pm and I was up all night listening to recordings of her playing. Considered one of the most exciting new musicians of her generation, Sting produced Ms Chan’s first album, “One,” a captivating blend of classical and jazz. Visually, Ms Chan is a star: beautiful in five-inch stilettos with a piano keyboard motif. In its 18th season, Wendy Kidd and Stewart Collins still work magic with the artists they bring to the small outdoor stage in Wendy’s beautiful backyard garden at Holders House. 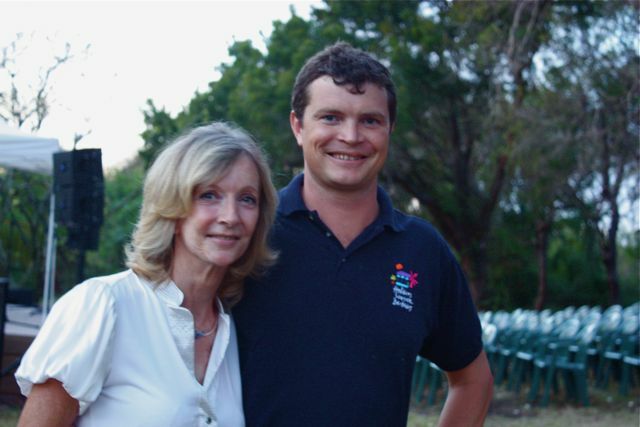 Wendy Kidd, doyenne of Barbados Holders Season, and her son Jack. I wish I’d known about it. I’ll look out for next year’s season. I was suggested this blog by my cousin. I’m not positive whether or not this post is written by means of him as no one else know such specific approximately my problem. You’re incredible! Thanks!